Packt Cookbook Giveaway | Yeah, But Is It Flash? 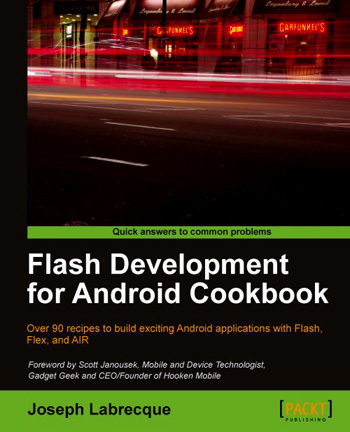 I’m giving away two copies of the excellent Flash Development for Android Cookbook by Joseph Labrecque, and you’ll be delighted to know that entering the giveaway requires almost no effort at all! So how do you go about getting your hands on a copy? Simple. Just head over to the book’s official page then add a comment to this post letting me know one feature of the book that makes you want to own it. The two lucky winners will each receive an eBook version of the cookbook. The contest will close on October 7th at 11:59 p.m. BST. Winners will be contacted by email, so please remember to use your real email address when you add your comment. The competition is now closed and comments have been disabled. The winners will be contacted. I’d like some pointers on how to optimise Flash applications for mobile. In particular, graphics performance. Congrats on the book! I’m especially interested in geolocation and controlling the update interval. Shaders. I wanna read about shaders. Optimisation techniques and cross device UI scaling. Maybe time for me to get an Android test device I reckon! Custom shaders? That’s what I wanna read about. I need to know more about playing video files or audio files from the local filesystem or over HTTP. Damn is that two?